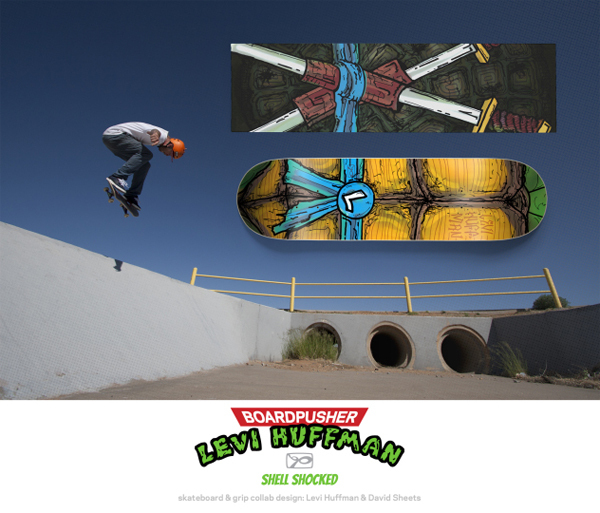 You may have noticed BoardPusher team rider Levi Huffman is a bit of a Teenage Mutant Ninja Turtle fanatic. From his multiple DIY skateboard graphics, to his toy collection, to even bronzing (or maybe just gold spray painting) a turtle to make his own jewelry, Levi is TMNT crazy! So when it came time to create a new skateboard design, there wasn’t any doubt as to where Levi was going to find his inspiration. 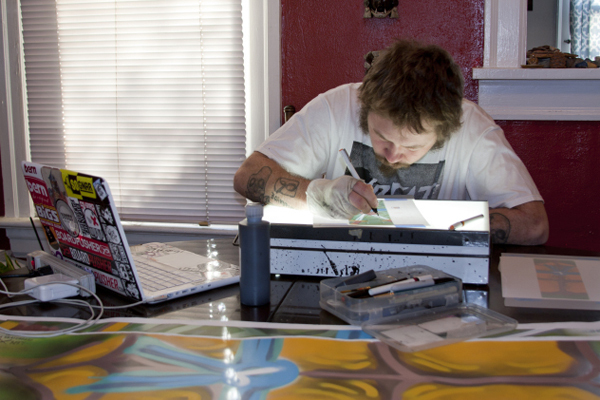 We started off with a couple of 9×33 inch canvases and Levi spray painted a base color layer. Once the paint dried, a trip was made to the local copy center to digitize the canvases by making a 300dpi scan of them. For the next step we printed out 3×11 inch versions of each scan. At that size, Levi was able trace the color layer with a black outline on a sheet of velum (similar to tracing paper), draw in all the detail he wanted and it would fit on a home scanner all while being able to stay in proportion with the final board graphic. 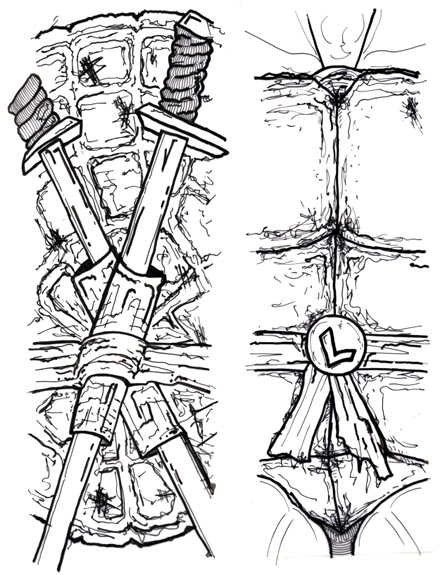 Once the black drawing was finished, the 3×11 inch art was scanned at 1200 dpi. At this resolution we could resize it to match the 9×33 inch canvas and 300 dpi print size. A little Photoshop magic was needed to help combine the color and the black outline layer together as well as some added elements to give it a more of a graphic feel. Some more details were added in different colors, but a bit shading was also applied to push key areas of the shell back. 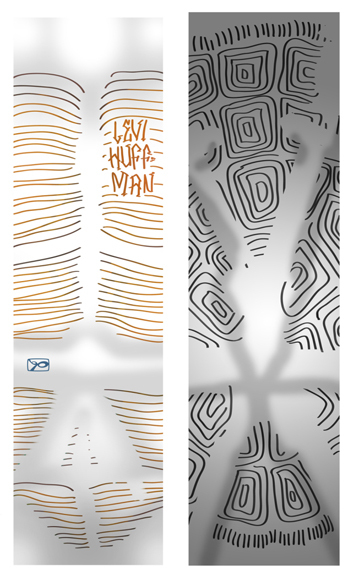 With the canvas, velum, and digital colors combined, Levi was now ready to upload his 9×33 inch 300 dpi .jpg skateboard and griptape files to BoardPusher.com. 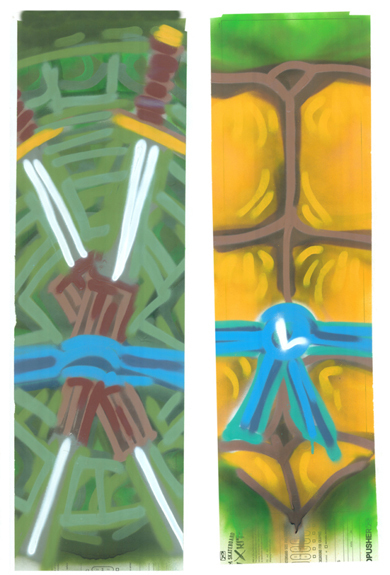 Levi’s “Shell Shocked” TMNT inspired graphics are now available here or apply these techniques to creating your own skateboard and griptape graphics on BoardPusher.com. We like fancy restaurants, especially establishments with fish taco’s and tasteful decor. So, it was a no-brainer when Wahoo’s Fish Tacos recently approached BoardPusher.com about filling some space on their walls. Our first thought was that it needed to be a skateboard deck series that not only would fit in with the Wahoo’s vibe, but also be something that the BoardPusher team would be stoked to skate. The “Fish Fight” deck series was born. 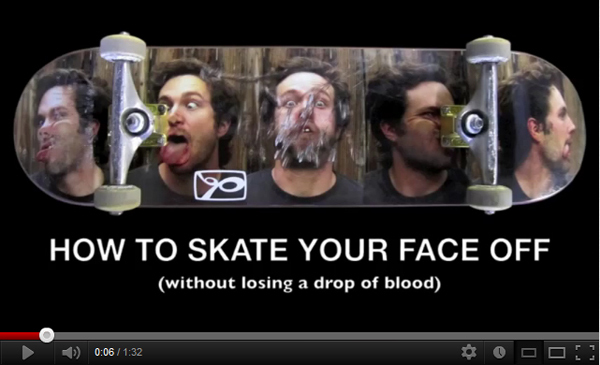 Always trying to pass on our knowledge of every possible way to put your own graphics onto skateboards, we documented our Art Director’s DIY process, then put together this How To video, as well as a detailed outline below to help you create your own split deck series. The “Fish Fight” series is also available here. 1. Decide weather you are going to split your series horizontally or vertically. 2. Knowing each board is roughly 9 x 33*, decide how many boards to use and create a canvas accordingly. 3. Create your full graphic. 4. Scan art in as a 300 DPI .jpg (local copy stores normally have large format scanners). 5. Download one of our deck templates here. 6. Open the template in a graphic editing program. 7. Duplicate the template layer for each deck desired. Ex. For 7 decks, 7 duplicated template layers. 8. Expand the canvas size to match the number of decks. Ex. For 7 vertical decks expand canvas horizontally by 700%. 9. Move the copied template layers over so that the 9 x 33 edges touch. Repeat until the appropriate amount of decks appear in a row and fill the canvas. 11. 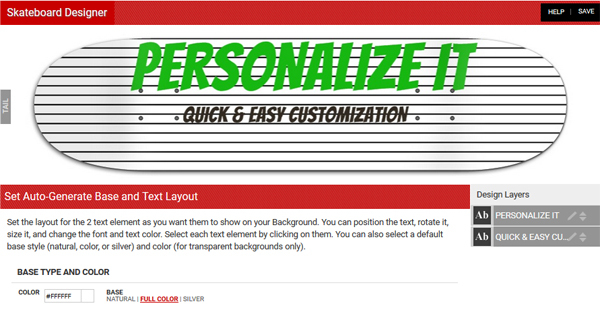 Select out your board graphic by selecting the first 9 x 33 template layer. 12. Leave the selection area the same, but switch to your art layer before you copy the selection. 13. Create a new file 9 x 33 .jpg and paste in your first board. Art should be saved as board1.jpg. 14. Repeat 11 through 12 for the appropriate amount of decks. 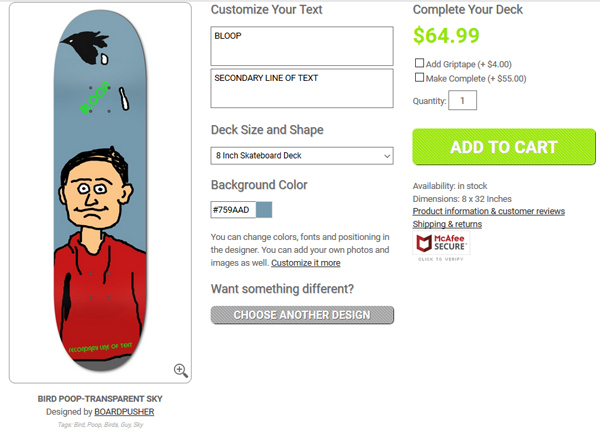 15.Upload each deck separately to the Boardpusher.com designer. 16. 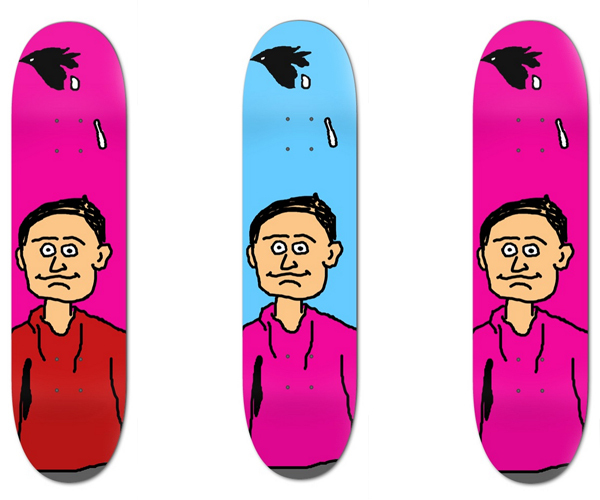 Place your order and be ready to skate or hang your series. Check out this video on how to turn your sketchbook drawings into your next sick skateboard graphic using BoardPusher.com. Below, we have some detailed instructions on how you can accomplish this yourself. 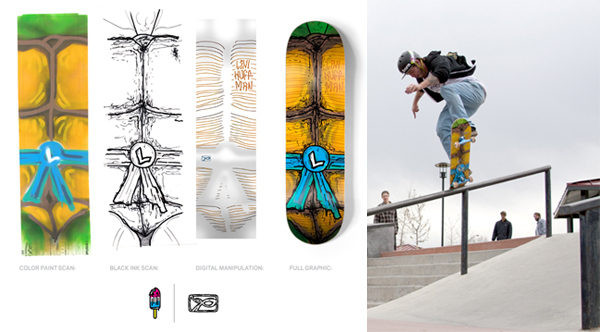 Most skateboard graphics are designed at around 9 x 33 inches at 300 dpi. Make a 3 x 11 inch area for your graphic in your sketchbook. Since your image will be three times smaller than a typical skateboard graphic size you will need to scan your image at 1200 dpi. Use the scanner input settings to adjust contrast and colors. 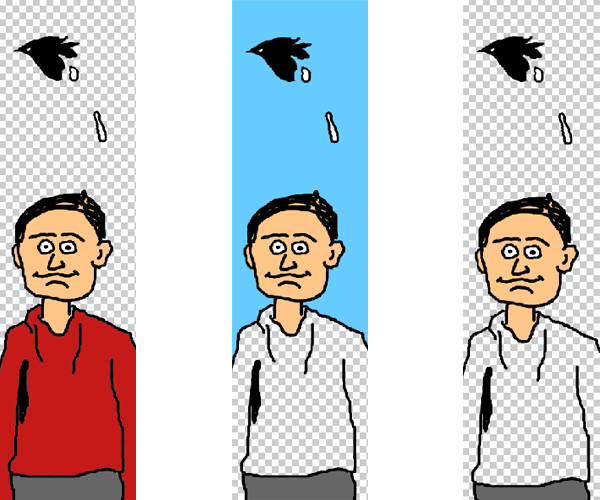 *Expand and rotate your graphic to fit the deck*It is important to remember that your image was scanned at 1200 dpi. If it is not or you are working with a different graphic that was not scanned at 1200 dpi then expanding the image will create pixelation and your graphic will come out blurry. 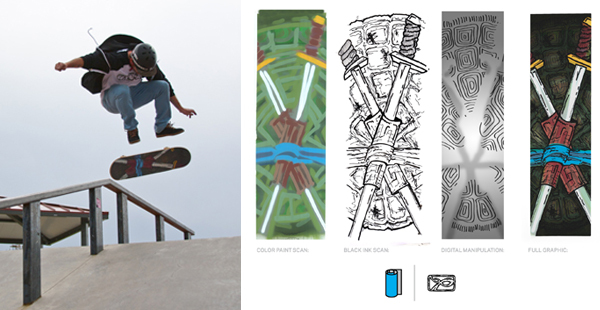 Save your skateboard graphic to your profile so that you can order it as often as you like. Don’t have a profile? Not a problem. Make one. It’s free. 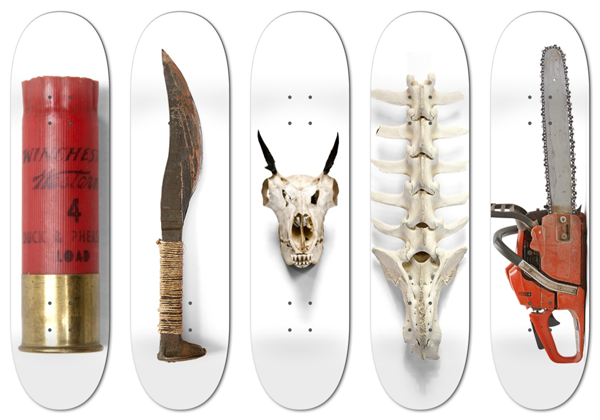 Add your deck to your cart and order your own customized skateboard graphic ready to destroy and display. Ever come across a picturesque scene that you thought would make a great skateboard graphic? Check out this video showing you just how easy it is to use the panoramic setting on your phone to transform yourself into a photographer and skateboard deck designer in one fell swoop using BoardPusher.com. Also, for the rest of January we are going to hook you up with free shipping on all BoardPusher.com orders. Use coupon could SHIPPANO and receive free domestic shipping through Sunday, February 1st, or $10 off Hawaii/Alaska, international, and express orders. Since applying custom griptape is a little more precise and challenging, we went ahead and created this “How To:” video to help you when you decide to design the top and bottom of your http://www.BoardPusher.com skateboard. I really love your custom griptape. I’ve tried to make cut outs before on my longboard’s griptape but i always end up messing up. I’ll have to pick up some of your stuff for sure! You always have the option of adding griptape to your BoardPusher order, but sometimes applying the grip can be a frustrating, or perhaps a brand new process. We get back to the basics and give you a thorough and easy step-by-step video on how to slap that grip to your board and even how to correct common mistakes. Though the video shows the classic black grip remember that you can design your own custom griptape here. Enjoy watching and learning http://youtu.be/n-2XQnFR9uY.